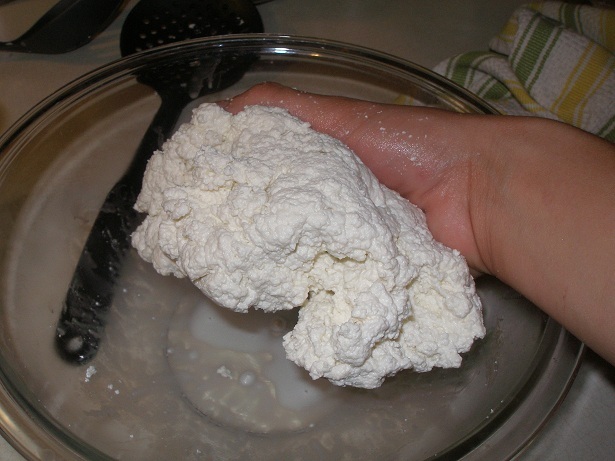 In the last couple of weeks, I have tried and failed twice to make mozzarella cheese in my kitchen. It’s supposed to be easy. 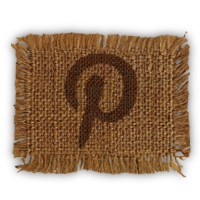 They say you can do it in 30 minutes with a microwave, or slightly longer without. 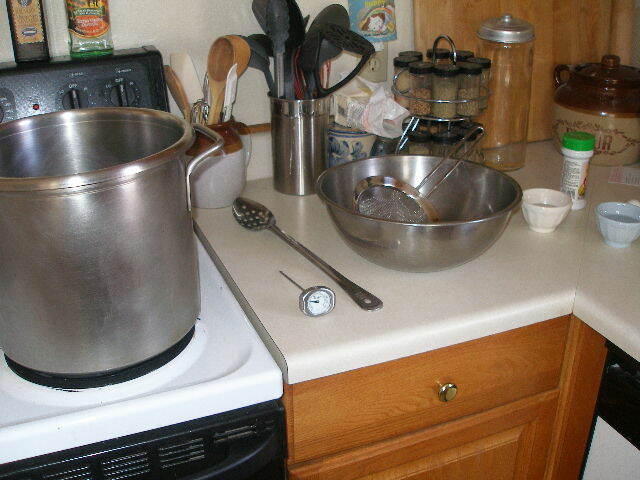 Here is a photo journal of my two attempts at cheese making. The first attempt actually went a bit better than my second. The pictures of my second try are in the thumbnails. 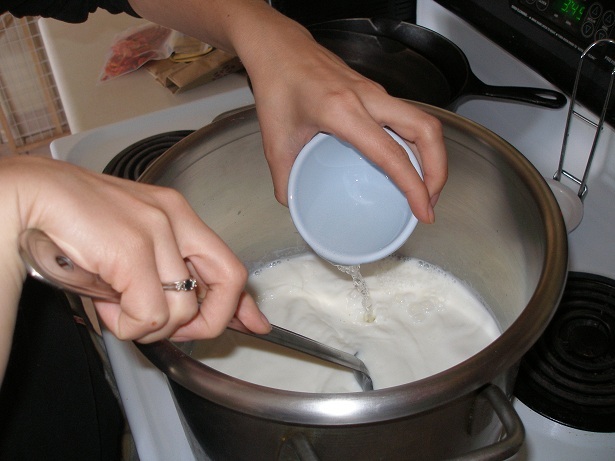 So without further ado, “How Not to Make Cheese” in pictures. 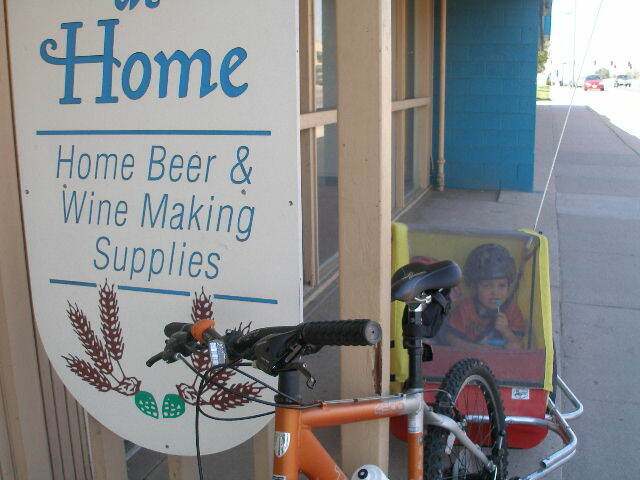 Step one: bike to local home brew store to buy rennet. I bought vegetable rennet tablets as that was all they had at the time. They do stock animal rennet, but were all out. Step two: back at home, gather supplies including milk that has not been ultrapasturized. 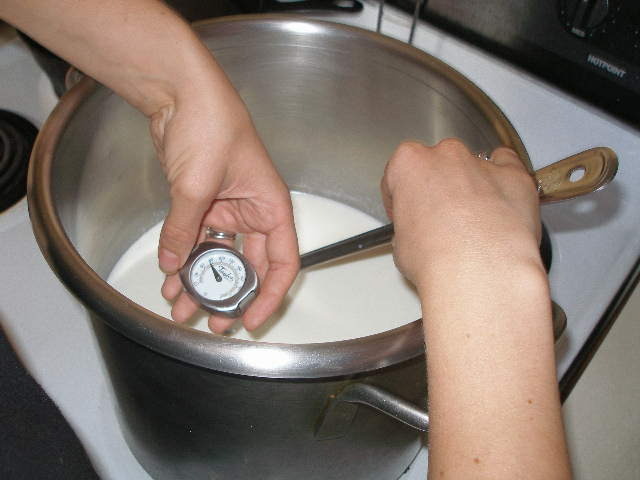 Step three: heat milk to 55 degrees and add citric acid. 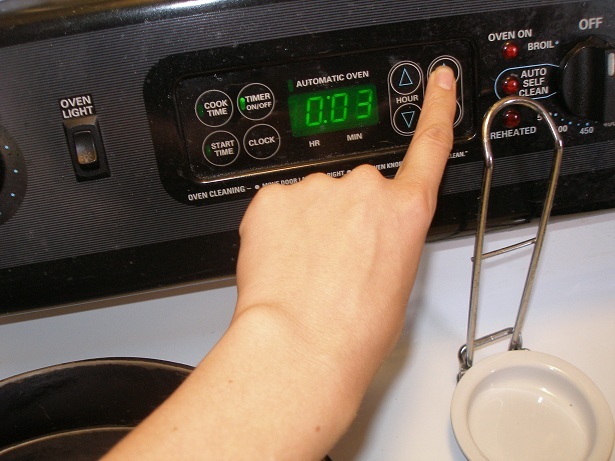 Step four: at 88 degrees, add rennet stirring with an up and down motion. 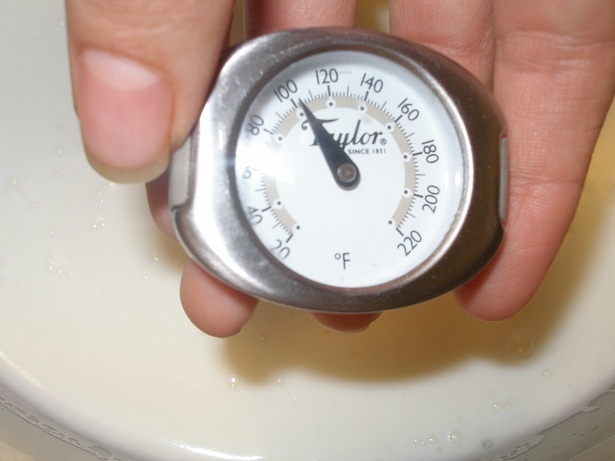 Step five: bring milk up to just over 100 degrees (some say 103 and some say 105). Step six: Check that the curds and whey have separated. 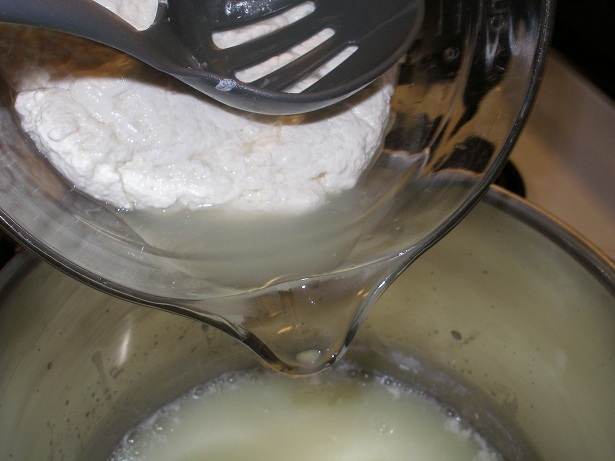 The whey should not still be milky, and if it is, let it heat a while longer. 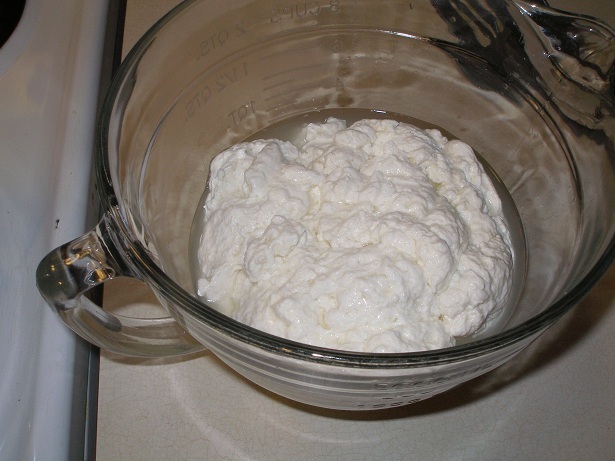 Note that the instructions for my first attempt did not include letting the curds and whey sit for 3-5 minutes, then cutting the curds with a knife. I tried this on my second attempt though. 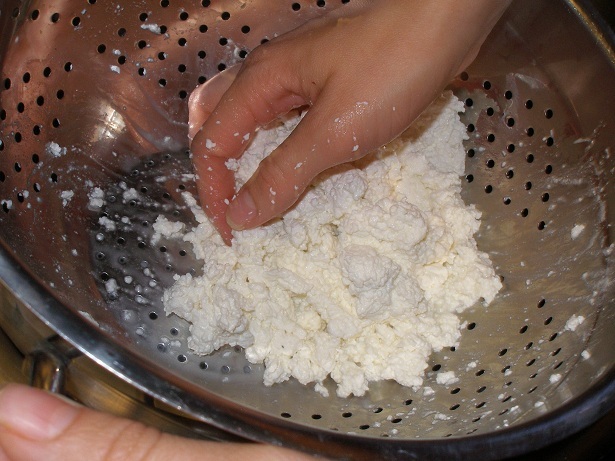 Step seven: scoop curds out into a bowl. Step eight: drain as much whey as possible back into the pot. Step nine: press the cheese into a ball. 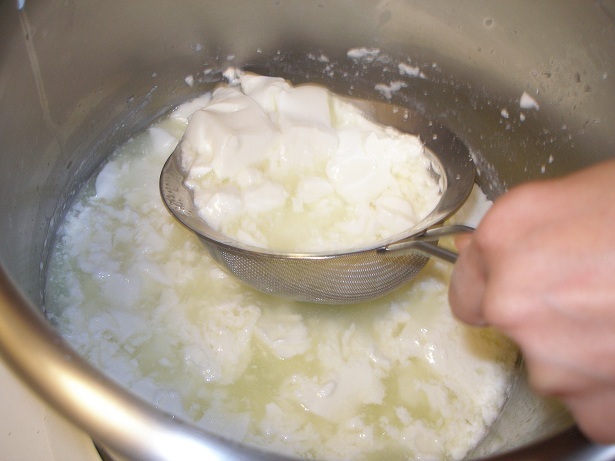 Heat the whey and return the curds to the pot to heat. On my second attempt, the curds were too soft. I thought I’d try using some cheese cloth to keep them together while they were reheated. It didn’t work. 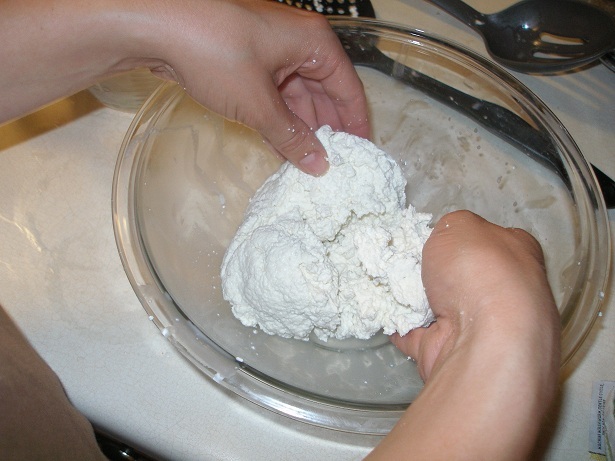 Step ten: knead the hot curds. Reheat as needed. Eventually the curds will hold together and get elastic. If they are crumbly, reheat some more. This is where my second attempt ended, with super hard, dried out curds that would not hold together at all. Step eleven: admit defeat. 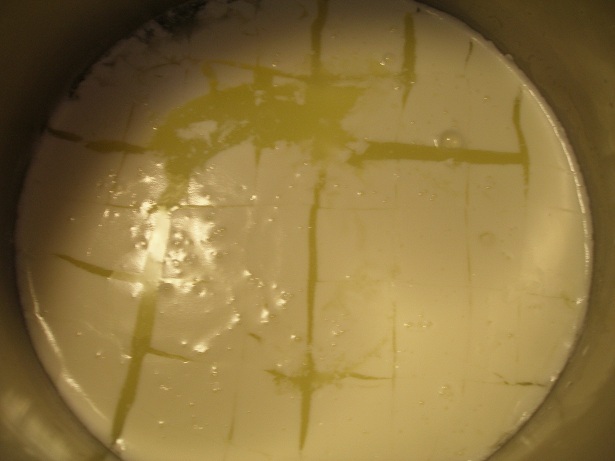 After a hopeful beginning on my first attempt, the curds got all hard and dry and unworkable. Not sure what went wrong. On the second try, as I already mentioned, they got to this point MUCH more quickly. 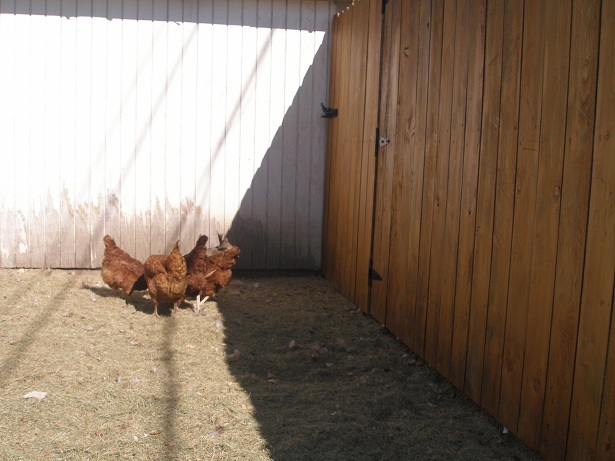 Step twelve: feed the gross hard curds to the chickens along with the whey – they liked it all at least. After my spectacular double failure, I was planning to give up cheese making completely, but Rick says I need to try again. 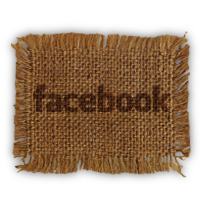 If I do, I will try using animal rennet instead. Anyone have any ideas or suggestions for me on what the heck went wrong?? I too have tried and failed twice… except I didn’t have any gracious chickens to eat my hot gross turds… er, curds. 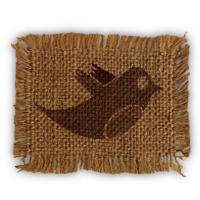 Maybe we should try again together. I have animal rennet, though it didn’t turn out any better than with the tablet rennet when I tried. AHahahahaha! I love that you said “turds.” 🙂 Made my day! 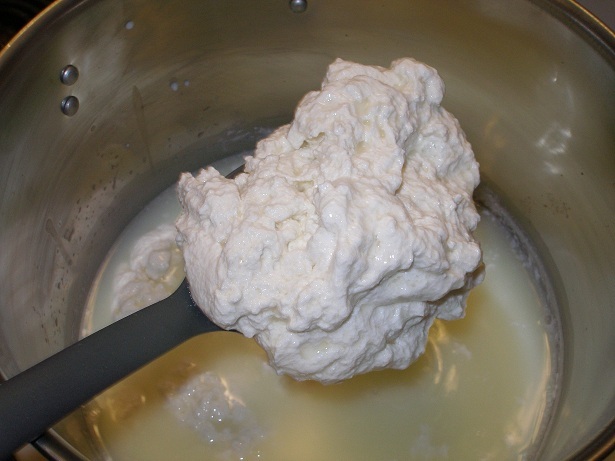 I haven’t made mozzarella, but I do make just regular old fresh cheese (pretty much just simmer milk, add lemon juice, curdles, strain curds through cloth. 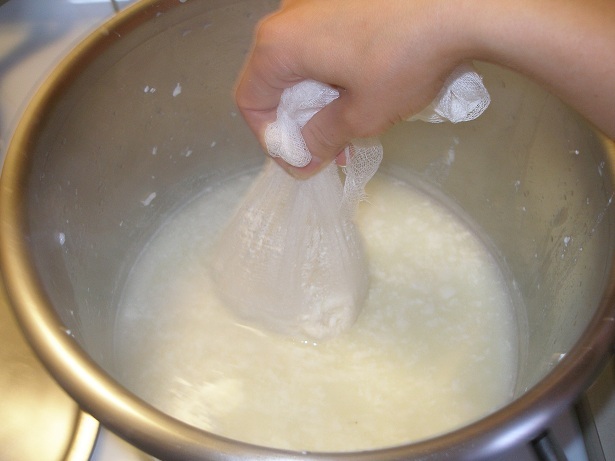 I find that nylon from old pantyhose gives the fresh cheese a nice texture). That’s it. Then you eat it. I do it with goat milk a lot, since everyone loves soft goat cheese! 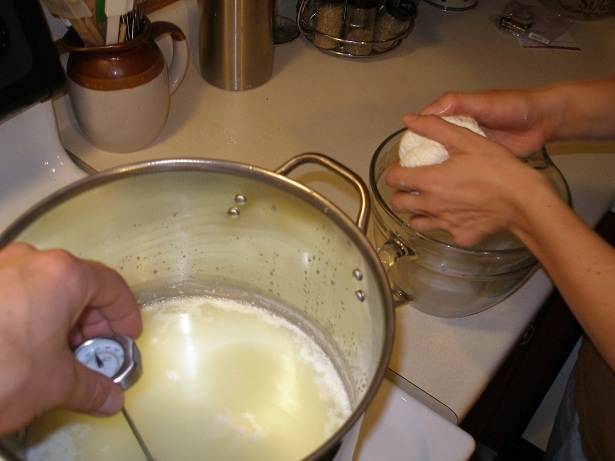 It’s a good way to get into cheese making without feeling like you aren’t making the cheese correctly. I’m hoping to get into making aged cheeses soon, but I need an outbuilding to let them age in first! Julia -do you flavor it at all with salt or anything? How hard do your curds get? I do salt it–just a little sea salt. Using lemon juice makes it a little tart. It doesn’t really get hard at all: it’s more like the fresh goat cheese you would buy at the store that you can spread on toast and things. Anisa, you might check here: http://thefamilyhomestead.com/mozzarella.htm for a great recipe. 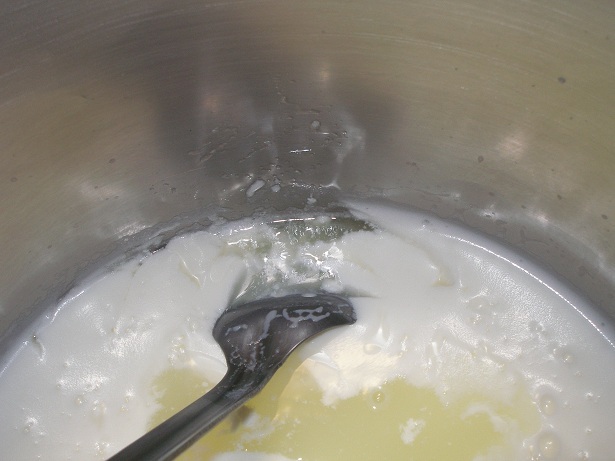 The book I’ve been looking at has 2 recipes for mozz and both say that after draining the curds to put them in the pot by themselves – not with whey – and to ladle off the whey they expel at that point. Anyway, I’m thinking of trying the recipe I just sent you because it has less steps. I’ve always had great success with her recipes. Julia, is this the Julia Skinner I use to spend time with in NW Denver area??? Anyway, I’m just imagining MY old pantyhose that you would NOT want to strain cheese in. lol. I’ve had luck with cream cheese, but am next trying mozz. I don’t think I can make aged cheeses while in hot AZ until I get an old fridge or something to keep them in and even that isn’t temp stable. When I saw the product towards the end I said, “why didn’t you just use it for pizza?” It seems like it might have worked – or lasagna – even if the flavor wasn’t too good the stronger sauce would have covered it. You were so close. 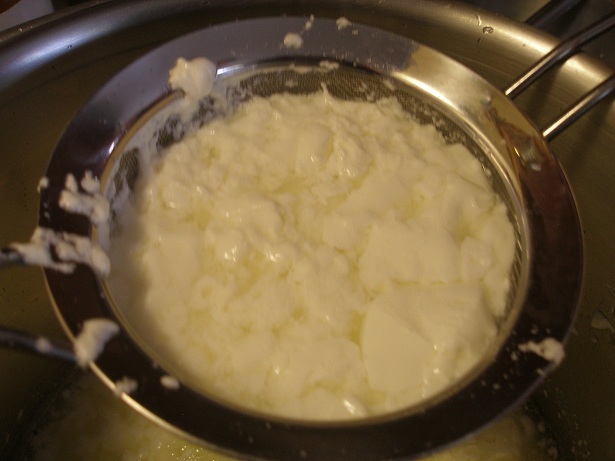 Just place the drained curds only in a bowl and microwave it 25-30 secs at a time to soften the cheese. 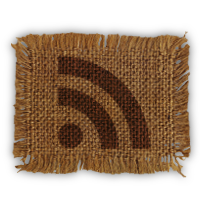 Take it out and kneed it; fold it onto itself; add salt; kneed it more; fold it onto itself; Re-nuke it to make it soft again. Pour out any additional whey that may bleed out of it. You will see it gets shiny and stretches like cheese. 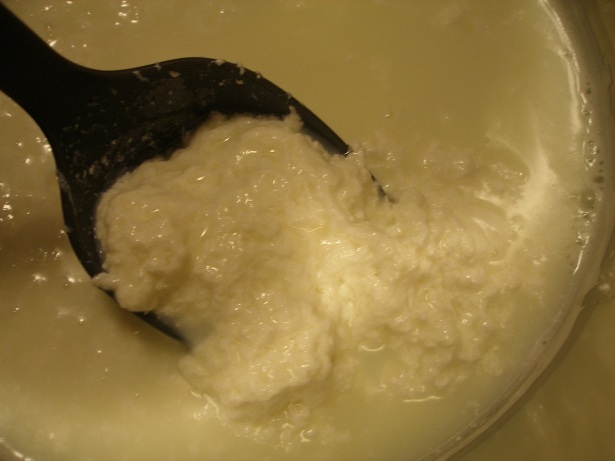 If your curds are too creamy; Let it set 40 minutes in the whey; If still too creamy, you need more rennet next time. Your curds looked good in the pictures. Just do that last bit above. You were successful in making cheese. You made a type of cheese called cuajada. The taste may be something you have to get used to, add a little salt. Its a table cheese in Central and South America.